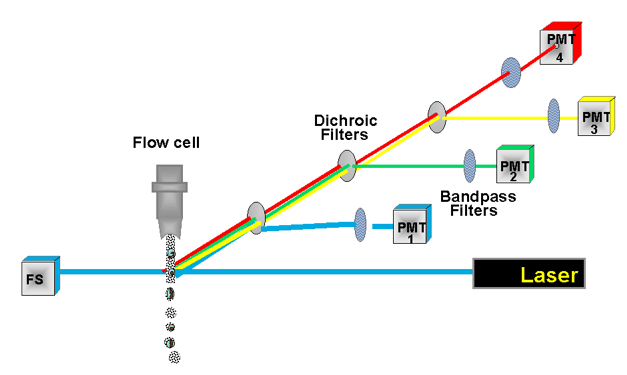 Flow cytometers have optical channels that detect a very specific wavelength range of emissions from the fluorochromes. A sequence of filters reduce the ranges of transmitted light. The detectors are all the same. 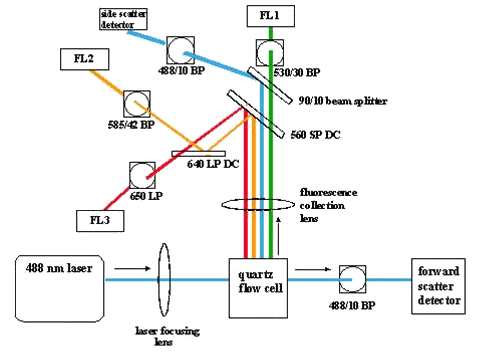 The breadth of the measurement made by any detector in the cytometer is determined not by the detector itself, but rather by the filters that precede the detector along the optical path. Fluorochromes do not adhere to tight ranges. Hence, photons emitted from one fluorochrome can be detected in a channel designed to detect another fluorochrome. This is called spillover. Multiple fluorochromes detected in one channel significantly hinder data interpretation. By compensating, fluorescence can be corrected and remove spillover fluorescence to enhance data display. Manual creation of the compensation matrix is possible but requires a large amount of work. Because of the exponential growth in the matrix size, it is not feasible with more than about 2-3 parameters. As an exercise, lets walk through how to manually compensate using a two color FITC and PE example. To manually compensate, plots must be made for each potential spill over. Hence, with two colors, you would need only one plot of FITC vs. PE. On the FITC single stain control, you would have to make gates on the FITC positive and FITC negative populations. You would then add the PE MFI to each and begin increasing the percent of spillover from FITC into PE until the MFI values for PE were the same in each gate. This would then need to be done with the PE single stain control; albeit this time making a gate on PE positive and PE negative and looking at the FITC MFI. Imagine adding a third or even fourth parameter. Way too much work! Software compensation is much easier because all that is required is to identify the positive and negative populations in each single stain control and the software can calculate the MFI values and amount of spillover automatically. This is done with a sophisticated algorithm that calculates the ratio of the difference in spillover fluorescence divided by the difference in the primary fluorescence for every combination of single stain control. It automates the manual process to increase efficiency and reduce user error. First and foremost, there must be a single stained control for every parameter in the experiment! An important consideration is to select the sample with the brightest fluorescence of the experiment. “Dimness” is relatively irrelevant. Only brightest matters, and that is so that low spillovers can be accurately estimated. For example, if a spillover is so low that a MFI of 10,000 doesn’t cause enough spillover to be above autofluorescence, then the system assumes no compensation is necessary. At a MFI of 100,000, the spillover becomes apparent and then compensation value can be accurately assessed. Compensation is only about estimating the slope. The bottom line is that because the compensation coefficients are computed based on the RATIO of the DIFFERENCE in MFI’s (of the spillover channel and the primary channel), so small absolute errors in the position of the negative control become irrelevant as the positive controls become brighter. The error in the compensation coefficient is the sum of the absolute errors in the MFI’s of both the negative and the positive control; the latter has an inherently much larger absolute error than the former. Any carrier for binding fluorochromes can be used for single stain compensation controls, such as cells or particles. However, the positive and negative carrier of a parameter must have the same autofluorescence. This is because compensation is a subtraction algorithm. It is imperative to NOT include autofluorescence in the compensation calculation, so if the positive and negative have the same autofluorescence, then the autofluorescence contribution to the compensation spillover calculation will be zero. If this is met, one can apply the compensation matrix to any population. For example, one can compensate on particles and apply that to cells. This rule is even more restrictive when applied to tandem dyes. Each lot of tandem dye (PE-TR, PE-Cy5, PerCP-Cy5.5, APC-Cy7, etc.) should be considered unique and require its own single stain control. If a user is using two different lots of PE-Cy7 in an experiment, then they need to have two PE-Cy7 compensation single stain controls, one from each lot. Different lots will have different conjugation ratios, i.e. more Cy7 conjugates to PE or less. Compensation controls must be treated in the same manner as experimental samples. This is because exposure to light and treatments like fixation/permeabilization may alter the fluorochrome, particularly the tandem conjugation ratio, i.e. lose some Cy7 on each PE molecule. The more events acquired in the compensation controls, the more precise the compensation spillover calculation. Therefore, try to collect ~50,000 events in your compensation controls. Much easier if you use compensation particles!! There is no difference in the accuracy of the two approaches for compensation. However, compensation particles do have numerous benefits over using cells. First and foremost, precious sample does not need to be wasted on single stain controls. All the cells can then be used for the experimental samples. In addition, compensation particles typically provide the brightest signal possible for any given parameter. Compensation particles are also more precise. The reason that particles are more precise for compensation is fairly straightforward. Cells have a large variance in background fluorescence (a high CV), higher than particles. This means that the spillover computation has significant error for compensation coefficients where the measurement of spillover fluorescence on cells is dominated by the error in the autofluorescence measurement. On the other hand, the particles have a much smaller error in the distribution of background fluorescence, meaning that the spillover computation is far more precise. Of course, particles have some limitations. Compensation particles cannot be used for all dyes (like PI, DAPI, or EMA), but they can be used with amine-reactive viability dyes. (Some manufacturers are now providing specific dyes preloaded into particles to use as single stain compensation controls). Particles do not bind all antibody reagents and in some cases they simply are not bright enough. For some experimental conditions using tandem fluorophores, one must ensure that the conditions of the experiment do not alter the emission spectrum of the tandems in a different manner than it would the particles (sometimes fixation or permeabilization steps may effect tandem dyes bound to beads differently than tandem dyes bound to cells). So, in fact, in many experiments, a user may have one or two cell-based compensation controls for some parameters used together with bead based compensation controls for the other parameters.